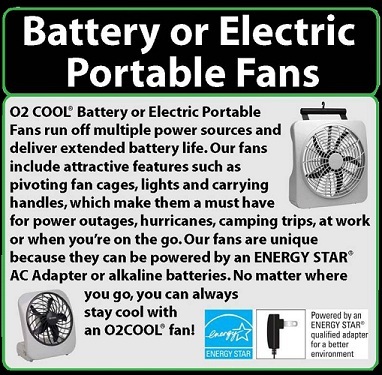 O2Cool Battery-Operated fans include multi-power sources, patented fan blades and compact designs that allow you to take the cool anywhere you want to go _ inside and out. Powerful 2 speed 5-inch fan blade. O2 COOL is the premier designer, producer and marketer of \xF1cool\xEE, creative, fun and affordable personal consumer products. We are the world\xCDs leading manufacturer of battery operated misting and portable fans, water-cooling hydration products, outdoor accessories and novelty items. Our products have one-of-a-kind features and cutting edge designs, thanks to our team of product designers and engineers who continuously work on bringing new products to life. We use this fan to cool off when dancing. 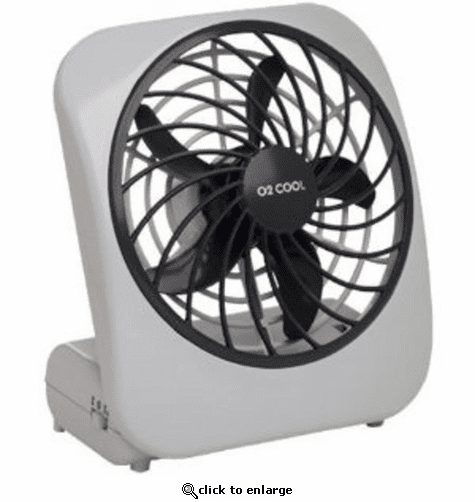 O2 Cool 5" battery operated portable fan a hit in Niger! My daughter is serving in Niger and needed a way to try and stay cool at night while sleeping - these fans have been wonderful! I spent some time with her in 2014 and used one of the fans at night and it was quiet and cooling! For evening temperatures between 89-99 degrees that says something! Thank you for an awesome product! my Battery Operated Portable fan is FANTASTIC! It has been so hot recently! Actually, I plan to buy some more , as gifts to my friends. Prosit is light, easy to carry with you, easy to use and such a relief!